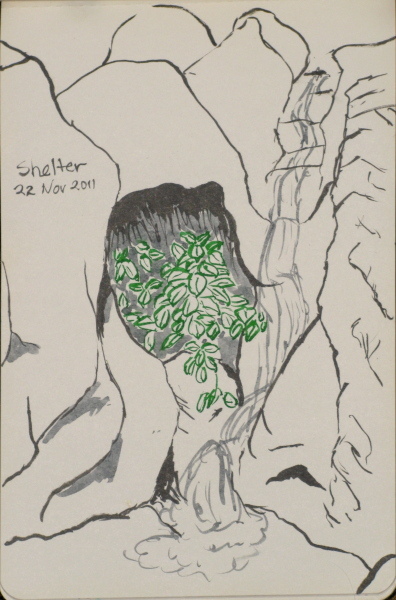 Sketches created "in situ" for December. 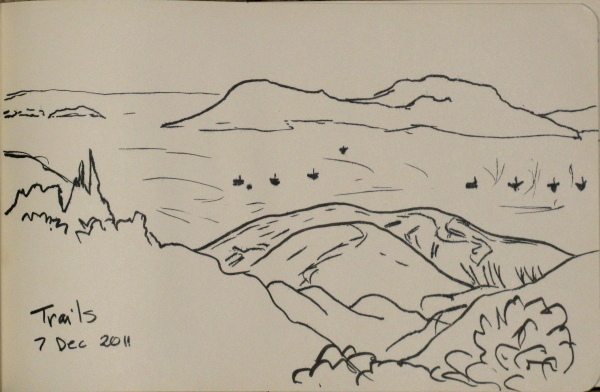 A glance over the mountain to see the ocean. Some fall color along the line of water. It gets rocky near the top of the mountains. An oak providing some of the rare shade along the trail. I don't remember ever going all the way up Tunnel Trail and set myself to doing so. 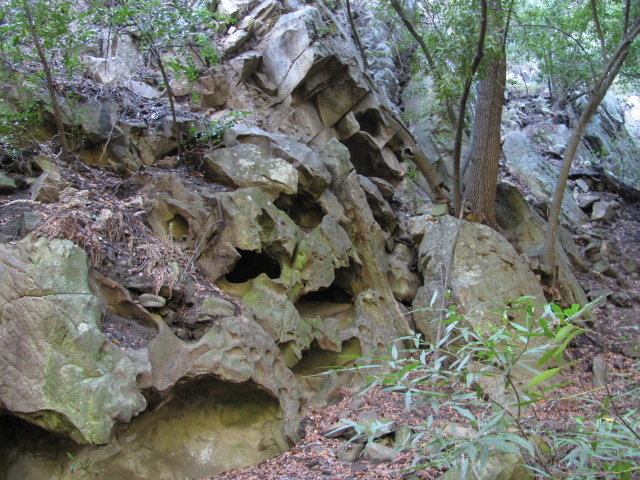 It is very near to Rattlesnake Canyon, which was such a common trail for us as children. 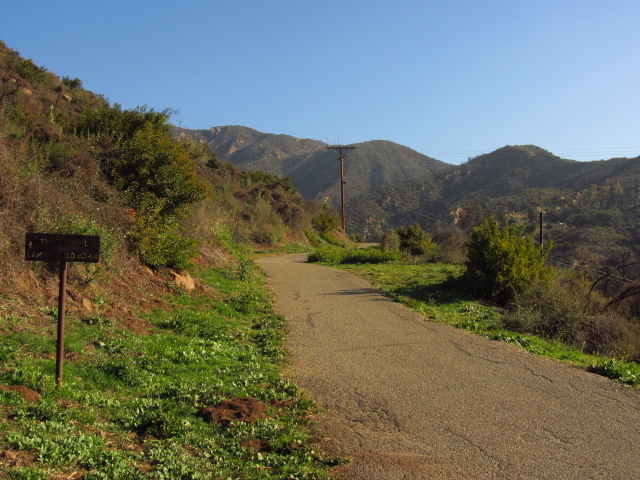 The trail follows Mission Canyon up and has a number of other trails coming to it. 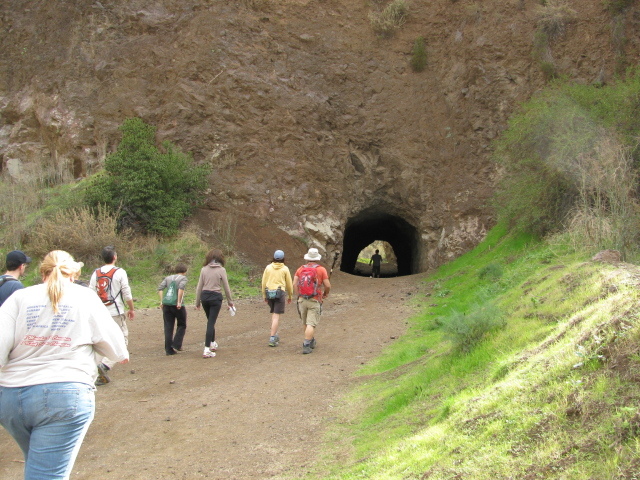 Hiking starts at a gate on Tunnel Road and proceeds up a utility road. Jesusita splits off to the left as the trail starts properly a ways up the road from the gate. About halfway up, the Rattlesnake connector trail joins from the right. At the top, it meets with Camino Cielo as the road to Gibraltar Dam turns off. The trail was apparently the route used to build the tunnel from the dam but existed before that. As near as I can tell, reading an old guide book, this was either the La Cumbre trail (as it comes up near that peak, so most probable) or Las Canoas (which as near as I can tell is what we call Rattlesnake now. The streets of the area still bear the name.) 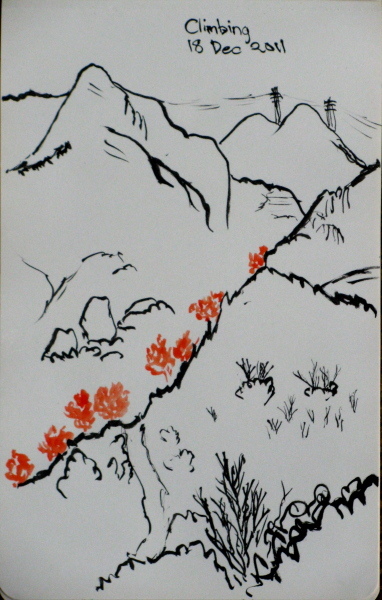 This was the main route used when one wanted to climb to the top, according to my 1904 guide book. It recommended coming back down by the Chamber of Commerce trail, by which I think it means the connector trail to Rattlesnake Canyon. 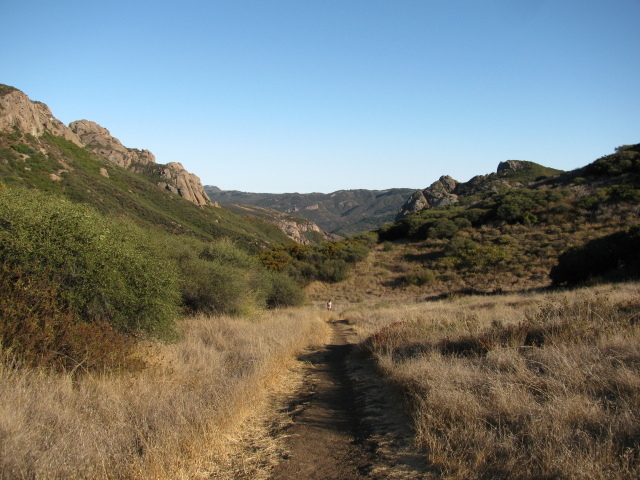 The book says, "It may be explained that the Las Canoas trail proper runs up the Las Canoas Canon and joins the Chamber of Commerce trail among the rocky crags about half way to La Cumbre, from which point the trail is the same." The use of the words "Las Canoas trail proper" makes me think it was just as easy then to find oneself on a random use trail then as it was when I was little hiking Rattlesnake. Actually doing this loop now would mean a lot of walking along roads with decent traffic and no sidewalks. After finding a legal parking space along the road near the trailhead, I walked up past the gate. The road turned off to the right where bins and dog mits were provided for dog walkers. The road became smaller but continued to be paved. The area stank of left dog waste and quite a number of people were walking up and down that area of the trail, many with dogs. 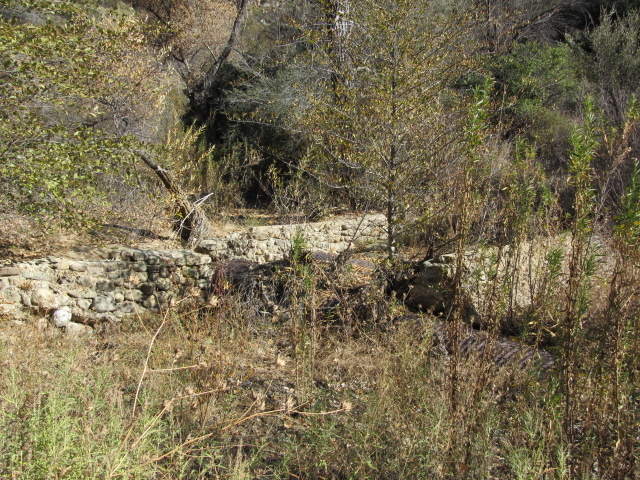 Old pipes and supports from water handling could be found along the side of the road. The trail continued up to some water handling facility where it crossed over Mission Creek, with a small trail up it, then the pavement got particularly rough and soon ended. The dirt road continued and then split, a sign pointing to the left for both Tunnel and Jesusita trails. Soon after that there was another split, signed with Tunnel to the right. All along the way, small signs of the somewhat recent fires could be seen but it was mostly green and growing. Just past the end of the publicly accessible road, a ribbon of tar road continues up the hillside. Tunnel trail is ahead, Camino Cielo is 4.5 away. Getting into the wilder areas of Mission Canyon as I get to the last of the houses on the far side. 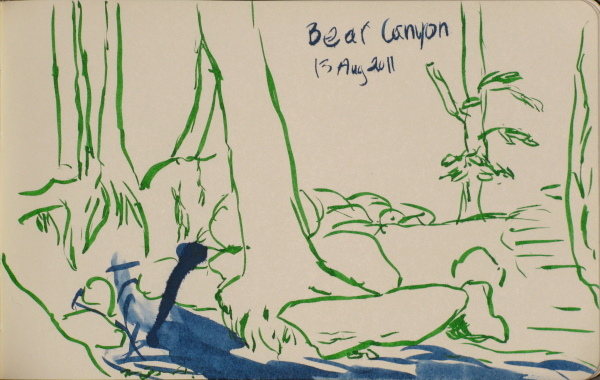 From the time we hiked the upper canyon area, I'd wanted to hike the lower canyon. I didn't then know what was there. The folks at Hike the Geek planned to go there and at first I'd remembered wanting to go. After reading a little bit about it, I remembered that I had actually got up there one afternoon and done a couple sketches although I didn't have the camera that previous time. I decided I would go again anyway. Trails make a number of loops of different sizes and further trails hike up the canyon after the loop. The largest loop is about 3 miles with a high road and a low road. 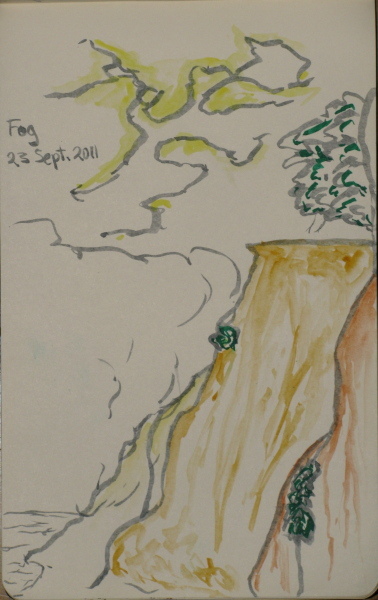 The high road gives views of the ocean and odd houses in the neighboring canyon and an overview of the canyon. The low road passes by old ruined cabins with more just off it. 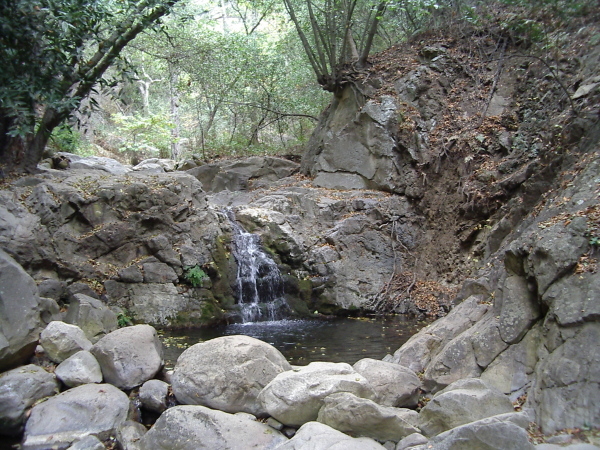 Little waterfalls tumble down the canyon near the largest ruins of an elaborate estate. A couple signs give a little history for the most substantial ruins. Continuing up the canyon past the top of the loop finds more cascades and tumble down ruins. We got collected and started up the low road through the canyon. We quickly came upon the local flock of escaped parrots and their descendants. We wandered past cabin ruins along the wide, rather well kept single lane of dirt road. We quickly came upon the scattered ruins and little waterfalls at the end of the road and started poking around the area. 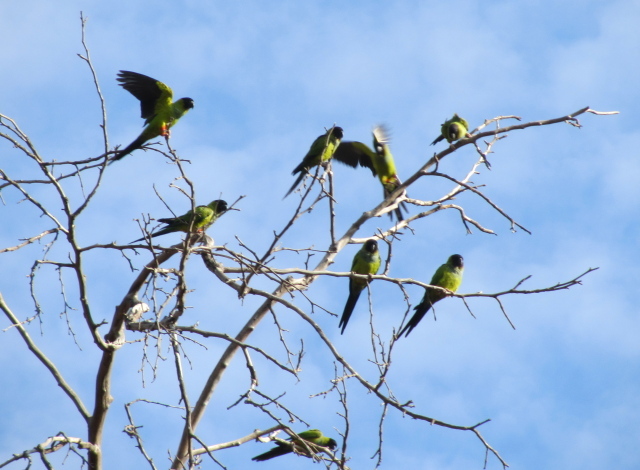 Parrots in the branches of a sycamore tree. The first ruin easily recognizable as a cabin. The Park Service tries to keep it locked away from vandals and folks it might throw rocks at. Looking around for hike suggestions, I clicked on this hike, thinking, "Alder Creek is in LA!" I miss the now somewhat recently burned and still closed Alder Creek trail and decided to try out this one. The directions on that site tend to be sketchy at best, but Franklin Trail is easy to find on the Carpinteria and White Ledge Peak quadrangles. It comes down to Juncal Road along the Jameson Reservoir on the back side, and that goes west to something that may be driven by the public (when the road is open), namely Romero Camuesa, which is the continuation of Camino Cielo after an intersection with no other open choices. Just find a place to park that isn't blocking the gate nor on the road a few feet after the ford of the Santa Ynez River, then start hiking up the closed road. The road behind the gate is currently a lot better than the road in front of the gate. It probably helps to have very little travel. The regular gate is quickly followed by another gate with long fencing on either side and posted "no motor vehicles". I had to crawl through the fence as there was no slot to walk through. Then there was a wide, dry ford for a tributary to the river. From there, the road just continued on, smooth and easy, up the side of the river. The screech of a hawk over the riverbed is common. It climbed a little from time to time, once where it was clear the road had washed out lower. Then after a couple miles, there is a ford for the Santa Ynez and it starts to climb. Above this ford is a narrow canyon and the dam for the reservoir. It was bone dry even though there was water over the ford just before parking. A deep pool a little way up had a little mud in the bottom, but that was all the water. Trees growing in the flood plane of the river. The river itself is on the far side of the valley and doesn't have all that much water in it. 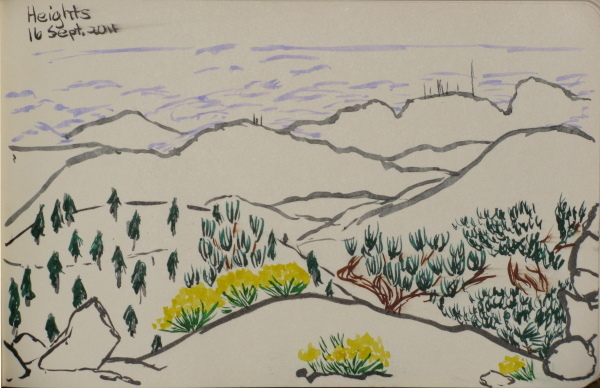 A line of pines growing on a ridge line high up the mountains and appearing to glow in the sunlight. The sketches for the month. 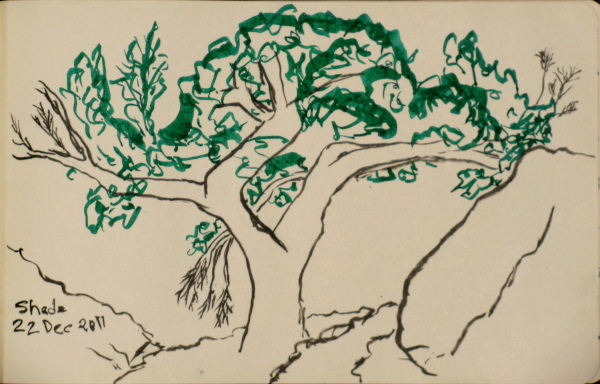 The large oak on the east side of Cottam Camp in Blue Canyon. 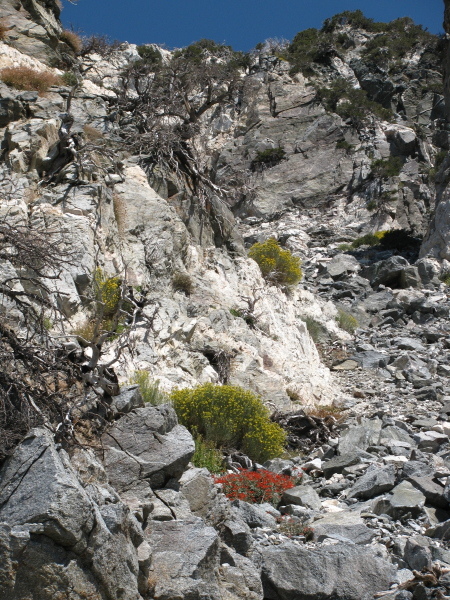 The blue rocks upstream of Cottam Camp in Blue Canyon. A small sheltered hole along the stream below Tangerine Falls. 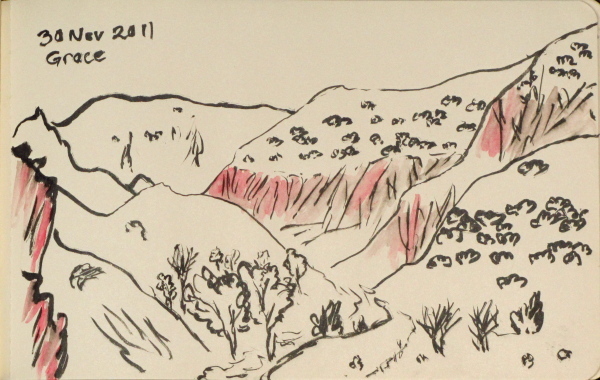 The red cliffs along Agua Caliente. 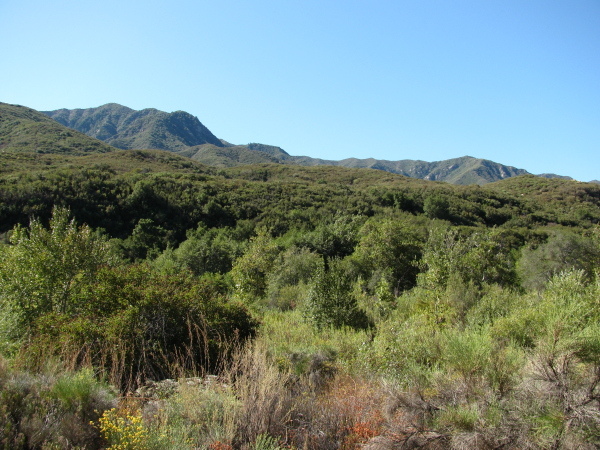 Agua Caliente Trail once provided a fairly direct route between ranger stations at Pendola and Potrero Seco (the later now just a campground) connecting to a couple other trails along the way. The route is likely to still be traversable, but actual trail finding may not be possible after about 4 miles. On the Potrero Seco side, a couple OHV routes follow increasingly close to the old route of the trail, but that isn't the side I hiked. 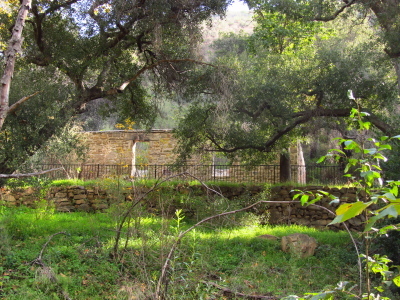 On the Pendola side, the trail starts at a warm spring. The water is directed into a deep tub and the area is popular just for coming to soak in the naturally heated water. The trail heads out from the end of the road, past a debris dam, and generally follows the creek up. Access can be blocked by the closure of one of two gates on the dirt roads, usually due to weather. The roads are currently getting a little bad, but are kept up to be passable by passenger vehicles until a deep water ford just around the corner from the parking. I expected the gate to be closed since the Los Padres National Forest site was telling me that it was closed in anticipation of a storm that had come through two weekends before with a good amount of water. In anticipation of it being closed, I actually had a plan to do a loop along Camino Cielo after the permanent gate and some of the nearby trails. Eventually the gate will be closed for the season, but it wasn't quite yet, so coming to the open gate I continued on. The road had quite a few rocks on the road, some of them far too large to drive over, and a few big puddles at the bottom which got the car nice and muddy. Getting to the deep water ford I decided to go for it because it didn't look particularly deep yet and I didn't know the parking was just around the corner anyway. When I got there, there were already four other cars, one of which had less clearance than mine. A guy in a bath robe was hanging around the main tub and it was otherwise empty. There are other tubs around, but I didn't poke around enough to find out where. Starting off, voices below the trail hinted to the location and that it was in use by a few more people. 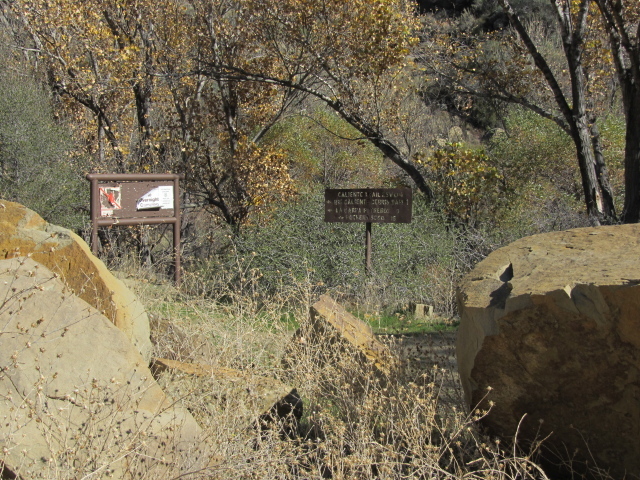 The trailhead at Big Caliente warm spring is at the end of the road, which is blocked by large boulders. The sign says it is 1 mile to Big Caliente debris dam (actually much less), 9 miles to La Carpa Potreros (a spring along the route), and 15 miles to Potrero Seco (if you can get there). The trail started out well used as it proceeded upstream, crossed the creek, and then started climbing a finger of land that the creek makes a tight bend around. Getting to the top, the debris dam comes into sight with the water flowing over the top into a big pool at the bottom. First there's a half view of the waterfall, then a full view as the trail is about to pass by the side of the dam. A collapsed wooden structure, or maybe just leftover beams, is below the trail there. After the dam, the trail gets a bit smaller as it passes into a wide, flat, treed area above the dam. The road once came up a little further and crossed the creek in a completely different spot. My sister and her husband wanted a hike while they were in town, so I needed to find something that wasn't too long or upward facing, but of course still wanted to get somewhere. 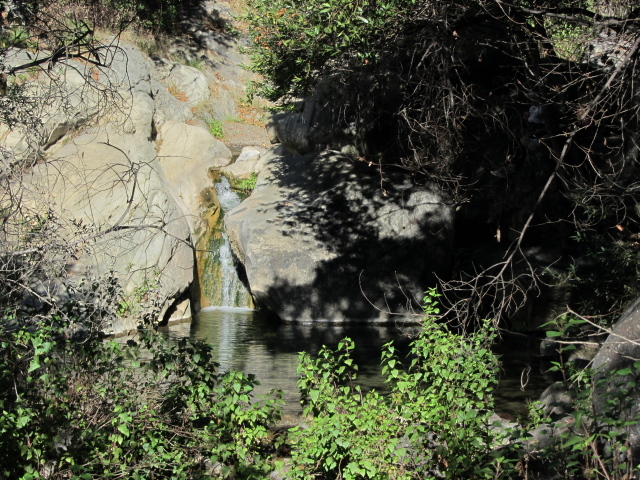 I decided to go up San Ysidro again to see the little waterfall. It was quite crowded when we got there, but there were a few spaces left. Getting to the trailhead, we found a table was set up nearby to give runners in the successor to the 9-trail race some water. We saw a few runners going both directions as we headed up the trail. The trail starts off at the end of that bit of East Mountain Road and progresses up between two properties to a private road, then follows a dirt path on the stream side along that for a bit before leaving the houses. There was a nice little flow down in the stream a short way below the level of the road. Then the pavement ends at a gate and the trail follows the dirt road for a bit. A signed trail leads to the right at the gate and another one crosses the stream to the left shortly after. A swimming hole along the way with a sort of water slide into it, except for the extra rocks in front of it. The road joined the utility road, following along to the left for a short way, then San Ysidro broke away from the road as a well used trail. The runners continued following the utility road, so we got a little less traffic as we went up the trail. There were still plenty of people going up the trail. A few flowers could be found by the side of the trail, but not so many. It finally rains a nice, soaking rain and I get tempted to go chasing after waterfalls. Sure, a soaking rain doesn't actually run off so much and the waterfall won't actually be spectacular yet, but the temptation can be quite great. Also, I'd found that this one had a route (as opposed to a trail) that takes one to the bottom of the waterfall and then connects with the trail above. I was a little suspicious about the connection as a reasonable route, but decided to try it. I got myself up to Cold Spring trailhead again and wandered up the trail, this time turning left at the sign to head up the main and west forks of the stream. Well... except I left the water behind in doing so. 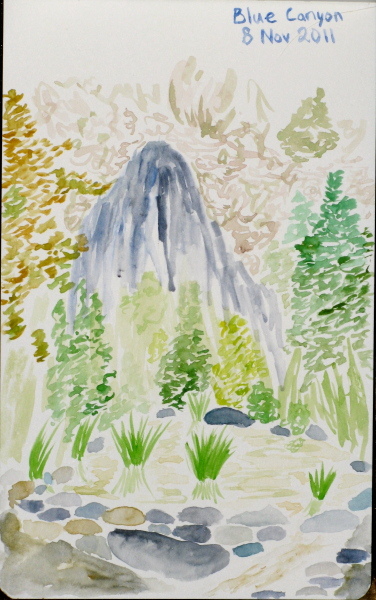 I continued on to the waterfall in spite of now following a dry creek bed. Some great rocks along the trailside. But then I can hear water again... except it's coming through the pipe that travels along the trail. 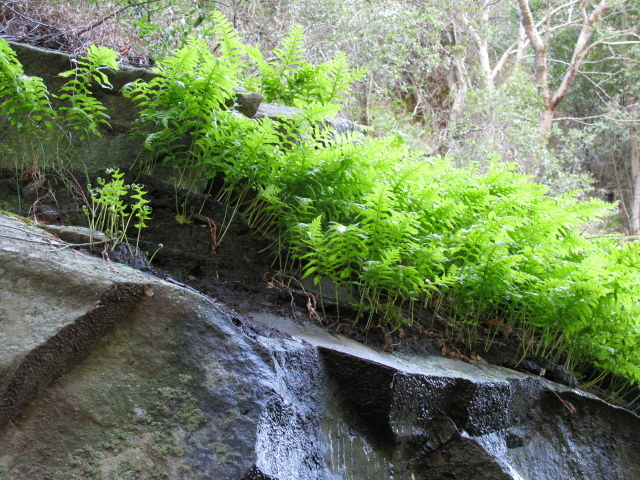 A great big rock with a bunch of dirt in a corner seems to be a good place for ferns to grow. I joined the geeks for another hike, this one to pass through the old "Bat Cave" of the Batman TV show and up to the Hollywood sign. I was sort of in the neighborhood and I have managed to never be anywhere near the remains of the Hollywoodland sign, so I thought I might go. Besides, Bat cave! So I got there and waited for more to come and found some new folks trying it out for the first time and then a few old folks and finally our leader, uncharacteristically late. 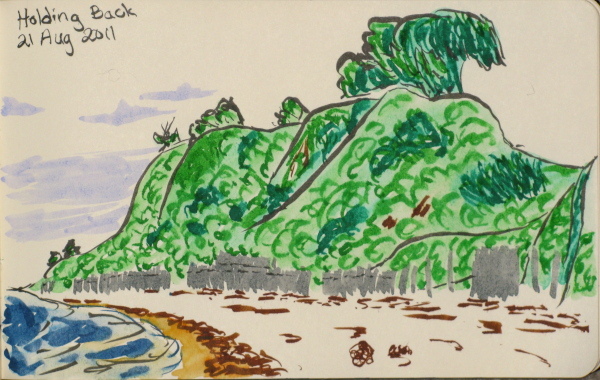 Once gathered, we headed up the road and took the right at a fork to get to the "cave". Apparently, this is the Bat Cave, or at least the entrance, even though it is not a cave at all. After poking around the tunnel, which had a couple more off it before getting all the way through, we headed back to the fork and took the left to start climbing toward the sign. We had a fair bit of up to do to get up to it, but initially went a little bit too far, getting over the hill to see out to the valley on the other side. 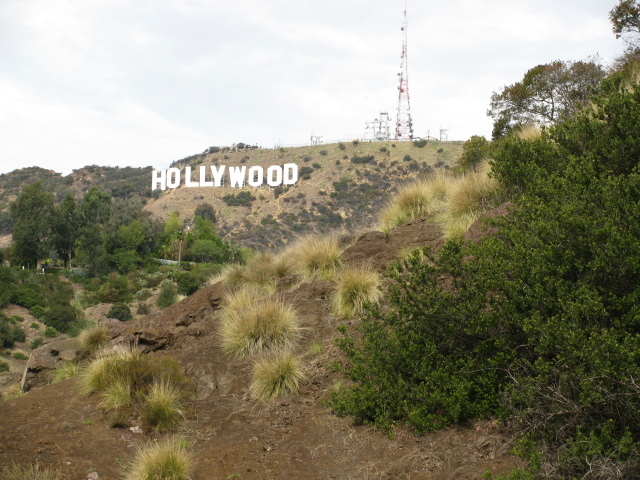 A pretty good view of the Hollywood sign from below and far enough out to actually see it. Following hiking the front country half of Cold Spring, I decided to hike (some of) the back country portion of the trail. There were no threats of rain coming the next day, so it was nice and clear when I got to the spot the trail crosses Camino Cielo. I got out the camera to take a photo of the great expanse of land to the north and sea to the south that I hadn't been able to see when I climbed up to this spot and the camera said "change the batteries". Whoops. Once I had the same batteries in a flashlight, now I don't. They had been charged just a few days earlier, so should have been fine. It might really be time to change the batteries, but for now I tossed it back into the car and headed off a half pound lighter than I would have. And took a few more moments to take in the sea of sea and sea of mountains. Taking Cold Spring into the backcountry offers a few options. The sign at the top simply says "Forbush 2, Mono 5" in holes cut out of a flat bit of iron in the style still sometimes done for signs that last. The distances are to campgrounds and just like the sign on the other side of the road that shortens the distance down by a half mile, these are probably somewhat less than the actual distance. Mono marks the end of the trail where it again meets road. 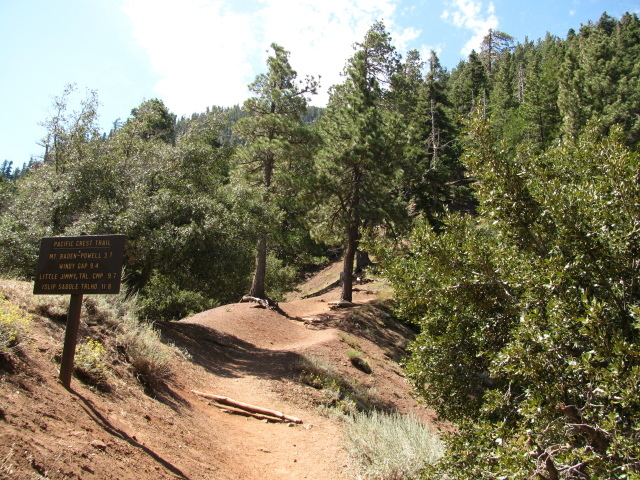 Shortly after Forbush Flat, a trail branches off to the right that follows Forbush Canyon down to where it joins Blue Canyon. At the meeting, trails lead up and down Blue Canyon. My plan was to go to Blue Canyon, which I estimated to be some 4 miles and 2000 feet lost. I continued on to Blue Canyon Camp, up Blue Canyon about a mile more before turning back. Soon after this point, there should be a trail that would is about 1.24 mile up to the road and then 4.5 miles along the road to get back to the car. Although not much longer, I decided not to do this loop since I didn't want to travel that far along the mostly paved road. If a shuttle is available, it might be nice to hike up Blue Canyon to where it meets the road, about 2.5 miles more up from Blue Canyon Camp. 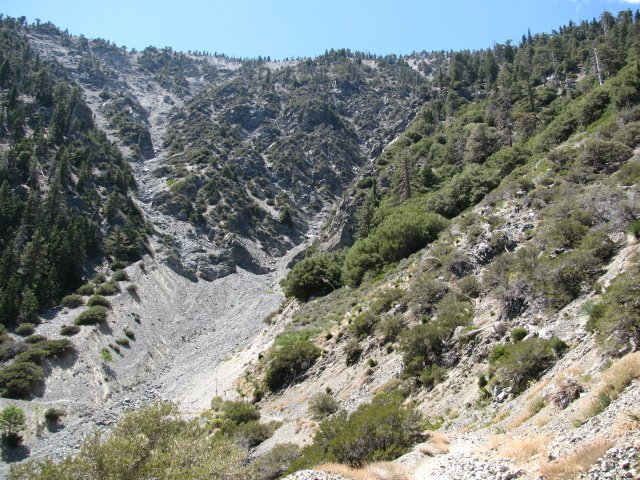 As the trail starts, it is dropping down from the ridge line into a large bowl of a canyon. It crosses a few creek beds as it goes, one even with a bench and a trough to collect water. After circling around the bowl, it follows down along the west facing slope, passing a very narrow and rocky opening that all the water the bowl collects must pass through. It then follows along down that side of the canyon wall, sometimes along a bit of wall that is quite steep. At one point, I found some plants with frost on them from the night before even though it wasn't all that early. The sun had still not managed to get over the lip of the canyon and warm those plants. With a few switchbacks, but mostly traveling sections, the trail came near a large flat area. Along the way, a few views into Forbush and Blue could be had. Very little could be seen of the canyon on the other side of the saddle. A triangle of paths with no sign marked the camp at Forbush Flat. Following the left route came right into the camp. It had a large fire ring, stove, table, and a few firefighting tools around it. Following a path further, I found a little stream with water ready to provide water to any travelers. Trail apparently went off further to the east, so this looked like it could be the intersection. The trail on the map seemed to loop a little that way before heading south again. I took the right to head toward some high rocks of a hue that, if they continued along that far, probably gave Blue Canyon its name and down the canyon. The trail proceeded steeply for a short bit, then came to the actual intersection. The sign simply said "Mono" with an arrow and "Blue Cyn" with another arrow. I turned right again, this time following trail in the expected direction, west. The trail is drawn on the map following right in the bottom of the creek going down Forbush, but does not do so. It stays up on the south facing slope and occasionally drops a bit by some very very tight switch backs. The side of the slope the trails are on probably makes climbing this at the end of a summer day a miserable expedition. The trail continues on just high enough to stay out of the thickest vegetation for most of the way. It did drop into the dry bed for a few feet when the vegetation wasn't thick, then climbed up again. It's had some weather wear, but is really very good. 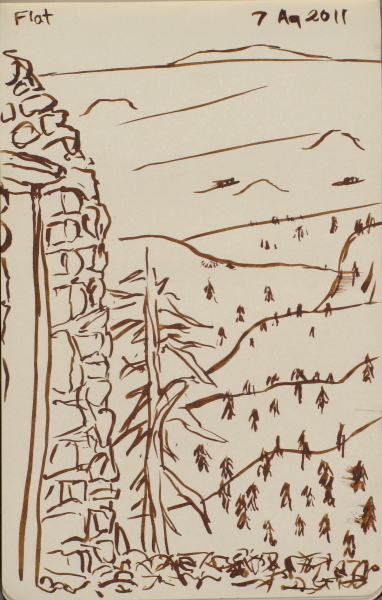 In the viewpoints above, power lines can be seen stretching through the canyons. Coming to a meadow under the power lines, I found many pieces of corrugated metal getting somewhat rusted, but could not find anything else to indicate what they were from. The canyon was starting to look more lush and I could hear water and soon could see it, then came upon an unofficial campsite in an open space. Soon the trail crossed the creek, now with water flowing. Soon it came to a very large meadow. 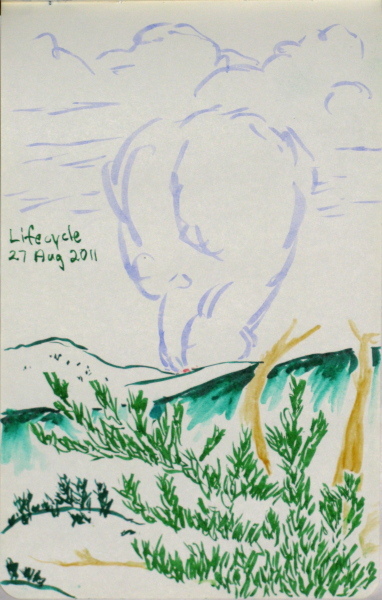 Some areas were covered in little leafy plants looking like the willows out on the tundra, except these had dried out. Mostly, it was covered with tall grasses sporting very spiny seed pods. 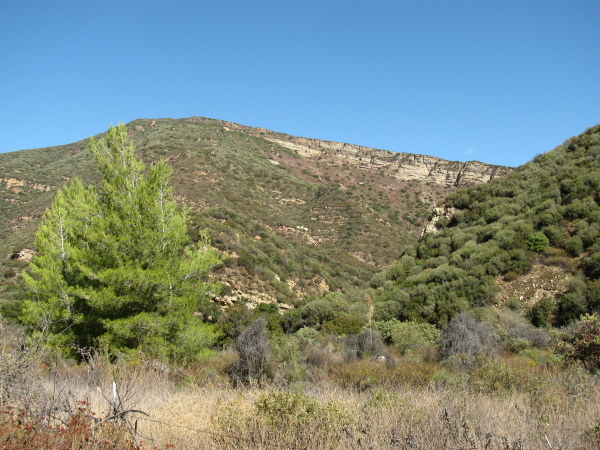 The trail crossed to the northern end where a sign said this is Cottam Camp, north is Camuesa, east is Blue Canyon, and back west 1.5 miles is Forbush Flat. Likely a bit of an underestimate. 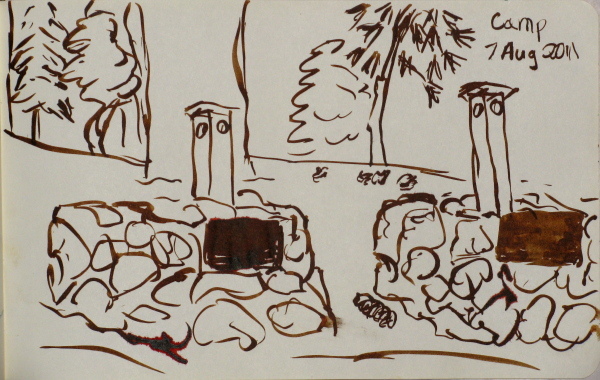 The camp itself had a circle of large oaks with a large fire ring in the middle. Someone had set the smoke stack from one of the very old stoves into the rocks. The rest of the stove was nearly intact down a trail west along the stream. Again, the camp was supplied with a picnic table and a couple of tools. Just down a small slope, the stream was flowing quite well. It looked like a nice spot to hang around and it was nearing lunch, so I took advantage of the picnic table. One of the circle of oaks around the central area of the camp site. 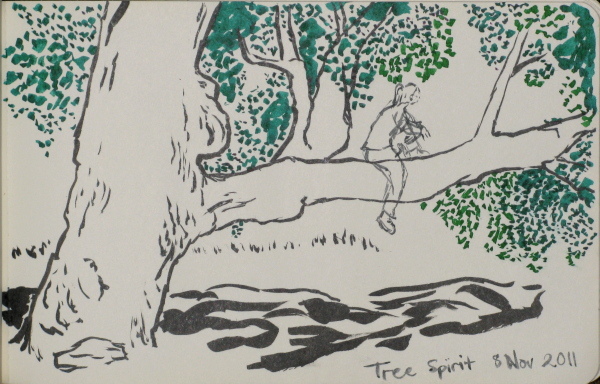 Many of them seemed to have good sitting branches and this one even had some stones to help one up to it. After eating a little and examining the map, I decided to make my way up to the next campsite. I followed the trail in the direction the sign pointed, expecting it to join with a bit of trail on the east side of the meadow that went up over a little hill on that side, where the map also indicated the trail went. This went along the creek, though. It looked like some people do try to make their way along it, but was probably mostly used by people using tent sites there. I backed up and found where the trail I expected to be on actually went. 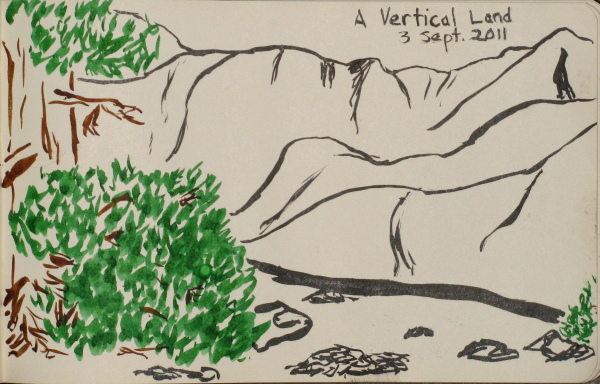 It stayed up high from the creek even though the map indicated that it would drop back into the stream bed soon enough. It passed through a number of washes and two tributaries that had water in them. At one spot, a large sand bar by the stream could be seen below and it looked like there were footprints in it. Then there was a steep cliff that someone had traveled up or down to get between trail and stream. Soon after that, I found a sign saying "Blue Canyon Camp" bolted to a tree, the bark beginning to grow through the letter holes. Behind the tree, a picnic table and one of the old stoves could be found. There were tools, but these were probably better used for opening sardine tins than fighting fires. Someone left them in a lunch bag with a note and the people who had eaten them had left the cans around the camp. Otherwise, the area was pretty clean. The creek was flowing nicely to the side. Someone had built up a little dam to get a pool, although it wasn't very deep. It was a pretty little spot and I seemed to be sharing it with a pretty little thrush. The pool with tufts of grasses growing. Blue rocks behind were probably colored partly by copper and look a little different from the other blue rocks further up the canyon wall. Deciding not to make a loop, I headed back down to Cottam Camp. While at the eastern edge of the meadow, I had spotted something that looked man made and I decided to investigate on the way back. I crossed a wide valley entering the meadow with a trail up it to the far side. The trail is likely the other route up Blue Canyon, but did not look to be well used. At the center of the valley, there was a trunk sticking up that turned out to actually be an old fence post. It had a bit of chain loop on it with a clasp, making it look like there might have been a gate there once. On the far side of the valley, what I was looking at turned out to be nothing. I followed along the south side of the meadow, passing another fence post, metal stuck into a part that had broken off and was on the ground near it. I then proceeded back up the trail that is not only 1.5 miles. At the camp at the flat, I decided to investigate the bit of trail headed out to the east. It first came to a second picnic table, so that camp is well appointed with tables, but then continued. I suspected it went to a nice lookout over the west heading canyon. Trails meandered here and there, but the best used one did indeed come to a lookout. Unhappily, someone had decided to use that area for a bathroom spot while camping and had left toilet paper in the bushes, never a pleasant discovery. Pack it in, pack it out applies to TP too. I headed back up to the top and the road afterwards. When almost to the top, I heard voices behind me. Eventually, a couple caught up with me, one playing music from something with bad speakers in her backpack. I let them pass, the only people I saw on the trail that day, then finished not too long after them. I hiked up Cold Spring trail from E. Mountain up to E. Camino Cielo and hit Montecito peak on the way back down. I started off well enough. I got directions from the Independent that told me to turn on Foothill/192 from Hot Springs, then down Cold Spring and park by the creek. I missed 192 because it is actually Sycamore, so got to Mountain and turned toward Cold Spring, thus finding the trail head which is on Mountain a bit east of the road called Cold Spring. I guess sometimes two wrongs do make a right. Three trails apparently leave from the creek. The one on the west side just goes far enough to find a good place to cross and then joins the main trail. The easternmost trail climbs to join the main trail much further up forming the other side of "the loop", if the map the Independent had is more accurate than their directions. The middle trail is the main trail and is signed with mileages for various destinations along the east fork including the turnoff for the west fork and pools along the creek. The peak is marked as 3.5 miles and the road at the top as 4.5 miles. I followed the trail for a bit. 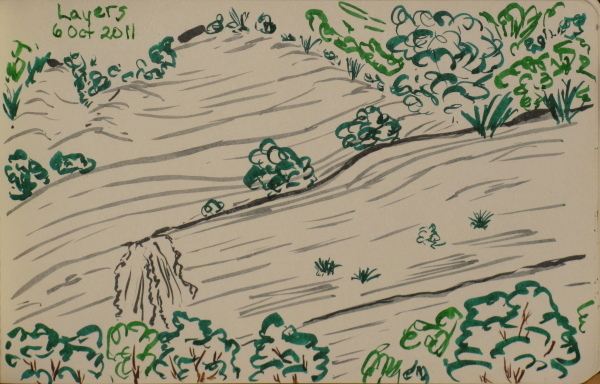 It generally follows the creek, climbing up out of the canyon a little bit from time to time as it gets tight. The trail only crosses the creek twice along the way. It passes by a number of pretty little cascades as it goes. 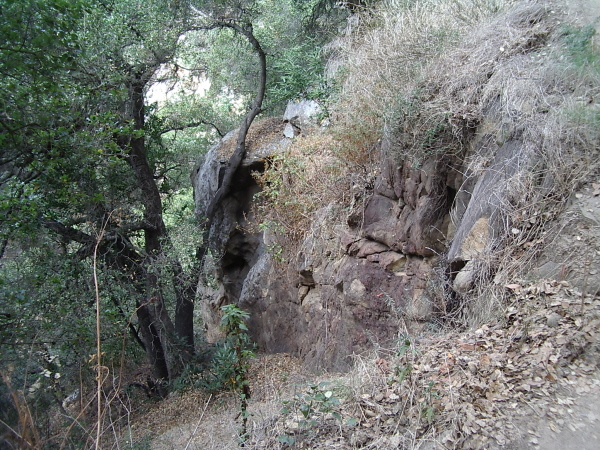 The canyon is rocky and tight, so the trail generally must maintain a height above the creek. A little cascade that is almost a waterfall just above the first creek crossing. The one sketch for the month. Little bit of water flowing down the wall of the North Fork. 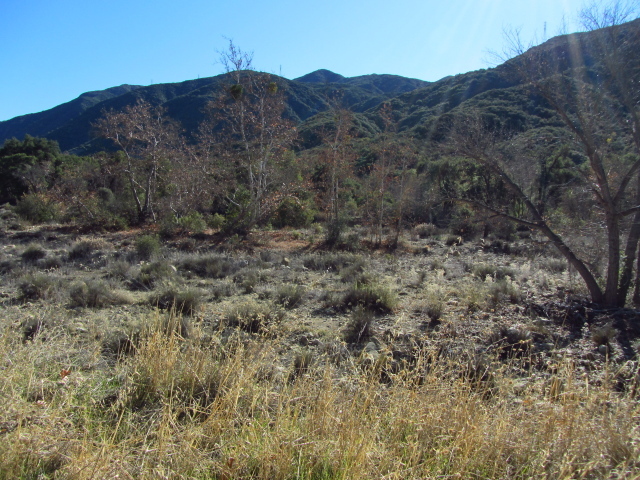 I opened up my Forest Service map for the Los Padres NF and picked a trail. There were actually two trails out of the trail head I was looking at, but one was along a larger blue line so looked more attractive. 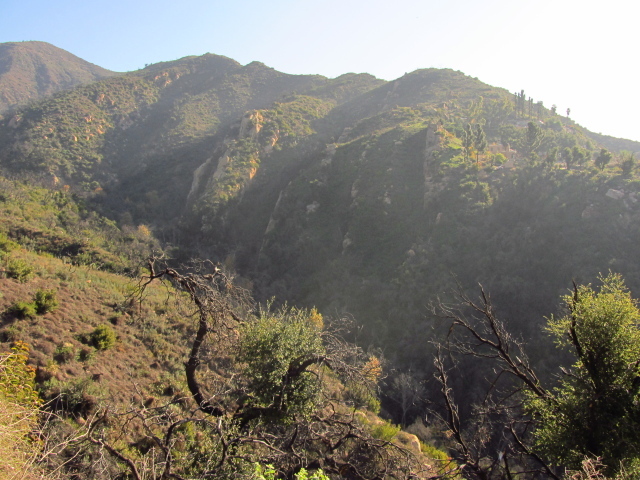 It followed the north fork of the Matilija Creek up for quite a ways starting just a few miles behind Ojai. A little research indicates that the trail up the main fork is the more popular one with a waterfall or swimming holes before it as destination, but there is a private property dispute along it. This dispute does not affect the north fork at all. Signs at the trail head make it clear where the dispute is although the public trail was well established and used for decades before they purchased it and they cannot actually bar the public from using the trail. Other entry, yes, but trail use, no. There's some indication that people can get permission to pass, if one wanted to go that direction without any worries. Trails leading along the north fork and southward branch off before the disputed path, so there are options that unambiguously require no permission. Looking at the USGS topographical map of the area, mostly the Wheeler Springs quadrangle, the trail looks pretty easy and the one trail log I found seemed to confirm that. Especially notable was the wide, flat valley it proceeds through. I also noticed that a short way up a tributary that was also a somewhat narrower wide, flat valley there was a waterfall marked. I thought I might make the attempt to see what this waterfall was like. It might be a trickle over what is really more like a cascade or it could be something impressive, but I wouldn't know unless I got there. I got a map together and printed it out and took off for the trail head. Then hanging out the Adventure Pass (the parking is in a fee area of the forest), I took off up the trail. The trail initially is really a road. It passes immediately into a developed piece of private property via a gate, so felt a little weird to be hiking there. There are no issues with passing on the road through this particular property except that it is "at your own risk" and they ask you not to frighten the animals. There are lots of animals including dogs, horses, and an aviary of ducks, geese, and peacocks. After passing the buildings, much of the land on either side of the road is private all the way to the turn off for the trail. The pavement ends and there are a couple of water crossings before the trail after a particularly wide crossing. The trail is well marked with another sign detailing the locations of private property. The valley is wide open and green as the trail starts. The trail crosses over the main fork as it starts, then quickly crosses the north fork as it turns to follow it. It is a slow climb throughout. As the canyon seems to be coming in tightly, the trail forks with the lower fork dropping into Matilija Campsite, the first of many camping areas along the way. The canyon really does narrow significantly just after the campground and the trail makes several crossings. Just as soon as it closed up, the canyon opens back up. 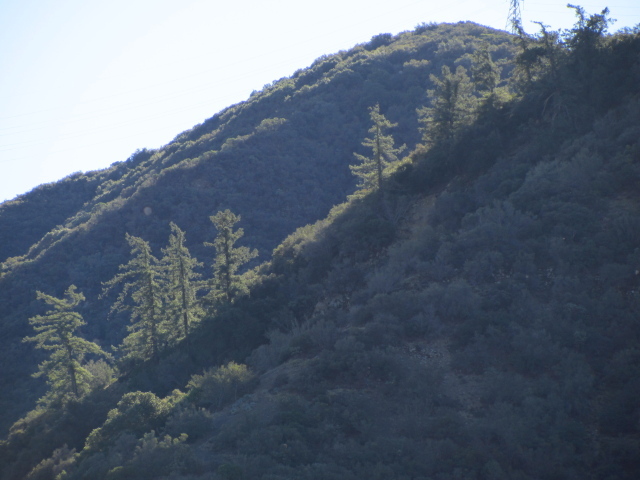 The big, green valley that the Matilija flows through. Looking up along to the north fork from along the road just before the trail turns off. Baldy hiding behind a tree across Vincent Gap. The creek by the campground. The view from near the lookout location on South Mount Hawkins. When doing the loop of trails out of Crystal Lake that brought me up to the top of Islip, I noted that the map I was handed marked a trail along Hawkins Ridge as well, allowing for another loop that stops by the two Mt. Hawkins. To do it, I again traveled up to Windy Gap, then turned east along the Pacific Crest Trail, the only direction I hadn't yet traveled from Windy Gap that contained a trail. Climbing up, the ridge trail leaves to the south, then a trail to Lily Spring. The mountain rises as a cliff to the south and at the far side, a trail proceeds up the top of Mt. Hawkins. Proceeding back to the ridge trail, I traveled down along the ridge down to South Mt. Hawkins. After taking in the view from there, I traveled back along the fire road until it crossed the trail and followed the trail back down from there. The lot in the campground next to the trail head was still closed with most of the campground, so I parked behind the Visitor Center again. It is only manned on the weekend, so no one was there but the handouts were in small cases so that people could grab them if needed. Proceeding along the main road into the camp and taking a right eventually, I came to the trail head and could start climbing off of pavement. Crossing the road when it came paved and when it came again in gravel, I made my way up to Windy Gap again, hopping over the same dozen or so trees. Clouds over the San Gabriel Valley just peaking over the mountains into the local valley, but here it's nice and sunny. Hawkins Ridge is up to the left and Islip Ridge on the right. One of the smaller trees stretches over the trail for an easy obstacle. 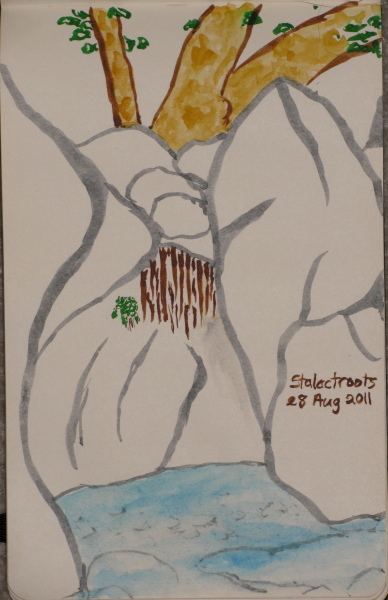 A cliff above the trail with a ravine along it and the plants trying to hang on. Locate the trailhead and the end of the trail. After hiking over to Big Horn Mine, I stopped at Buckhorn to look for a camping spot so that I might hike around one of the many trails in the area again the next day as well completely neglecting that it was a three day weekend and the campground would be a madhouse. The sites were overfull with people packing three cars and over a dozen humans into sites that only allow two cars and eight people. I walked down the trail a short way to read for a bit, then turned to go home and found the sun to be at a level that completely blocked my vision when going in the direction the road goes. In the campground, I could just stop and get a view of where I was going, but I wouldn't want to miss a turn at speed. I decided to really see where the road at the end of (what is now) Buckhorn's exit really got to. I parked in the turnout in front of the old road and made my way up its water rutted route to near the saddle, then followed it further. At the top when it turned, it still becomes a very good road traveling along the ridge. Again, I saw no indication of the spring listed on the map as I passed where it should be. The road splits, and I decided to try the upper leg of the road. 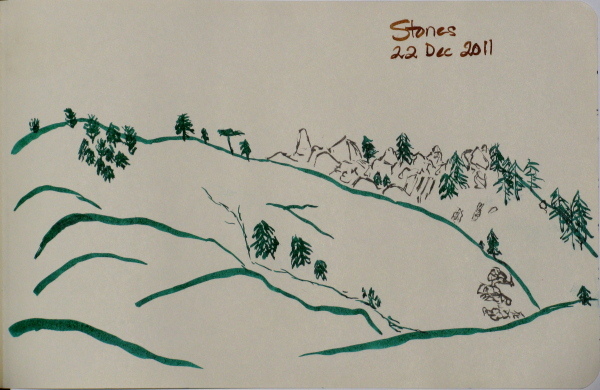 It continued along by rounded boulders and sparse trees. As I went, I found I was following tire marks from a mountain bike showing other people do come up here. There was a downed tree or two along the way, but otherwise the roadway was perfect as it travels approximately along the contours. 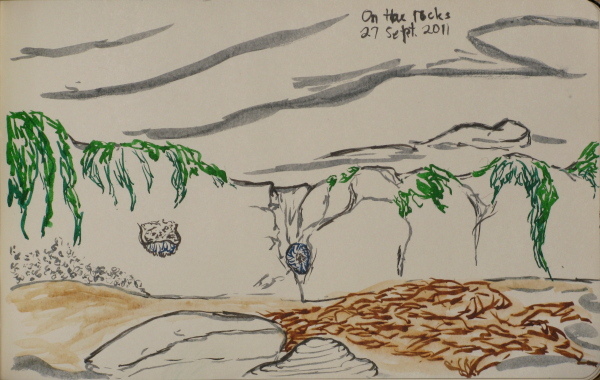 A few of the rounded boulders that abound. The area around Iron Mountain is riddled with mines. I've got a hike hitting many of those mines in my dream hikes, but that has not happened yet. While looking around the map for the various mines, I found one far up north that would be much easier to get to as it was down an unimproved road just a couple miles from the highway. Looking it up, I found that it is a popular hike that is still possible to make and that the cabin of the man the gap and gulch it starts at is named for can be viewed nearby. They say it follows the old wagon road to the mine, but I'm not so sure that's entirely true, although it is probably close enough. I printed out a map and headed to Vincent Gap. Vincent Gulch is a wide open valley heading down toward the San Gabriel River (prairie fork going to the east fork). 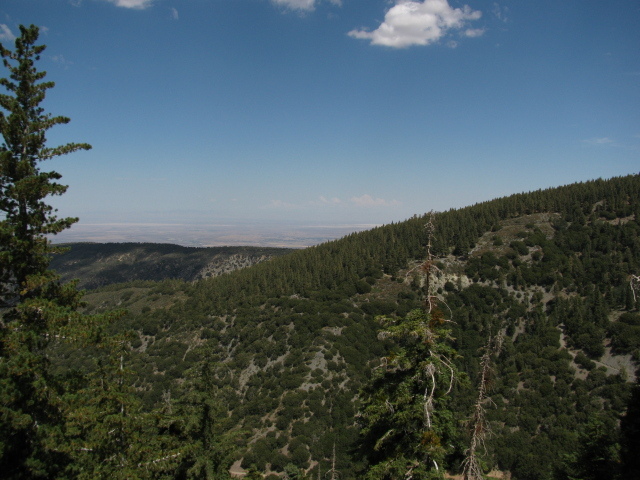 Mount Baldy is visible in the background and the Blue Ridge is to the east. The trail starts next to the Pacific Crest Trail heading up to the top of Baden-Powell, but heads off in a fairly flat route along an old fire road. For most of the way, the road is wide and flat with very little vegetation along it, but there are a couple bad spots. Very soon, a trail branches off to the left at a large informative sign. This is the trail down Vincent Gap (not shown on the USGS map before 1995). Shortly after, there is a mine symbol on the map above the road that I did not investigate. Then as I came around a turn, I could see that the road had fallen away at a ravine. There was trail through this spot with a fairly solid bed, although rising and falling in unplanned ways. A big drainage for collecting the rain that falls on the side of Mt. Baden-Powell. The stoves at Little Jimmy Campground. The cabin at the top of Mount Islip. Somewhere up Bear Canyon a ways. The remains of a sea wall past Goleta. Smoke from a dry lightning strike. We watched it get up out from the mountain top. 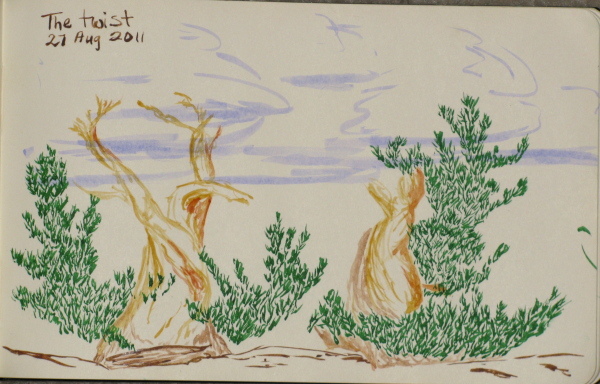 A few bristlecone relatives with very little bark left at the top of the mountain. Roots that come through the rock. 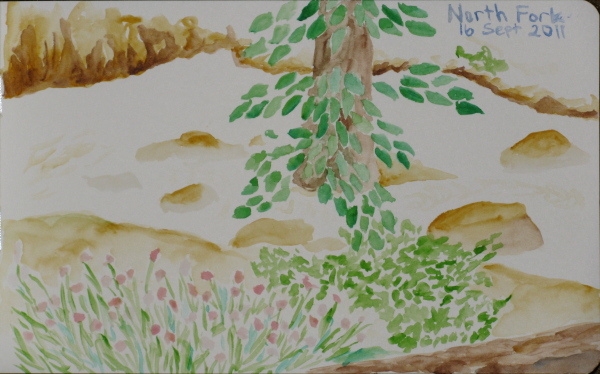 I had read about a trail to a place that was full of funkyness and a good place to go on those hot days as the destination is shady and has pools of water and water flowing around, at least after the rains. The general plan for hot days seemed to be hike down and wait until it is cool while playing on the boulders then hike back up. This was a hot day and I really wanted a hike, but it wouldn't be expected to be flowing very well. I decided to try it out anyway. I had errands to do before hiking, so didn't get started until the middle of the afternoon. I had a bit of an extra drive getting there because the directions missed a turn. Even the gooogle maps directions missed a turn. Something about being on two roads that are actually the same, then a third joins and one of the original roads continues while the other two turn... Anyway, my directions said to be on the one that continued, then turn onto a road that I never saw because it was actually a quarter mile further along after making the turn. I figured it out and got to the Circle X Ranch where the trail starts. Parking is at the top and a short way down a dirt road. Since it was late and the lower lot has a gate that is supposed to close at sunset, I decided to park at the top. The road goes to a campground and on the far side of that is the actual trailhead. After that, the trail is a well established path headed generally downhill. As I went down, a few of the last people already down there were coming back up. Starting off down the trail while someone comes up from the grotto below. 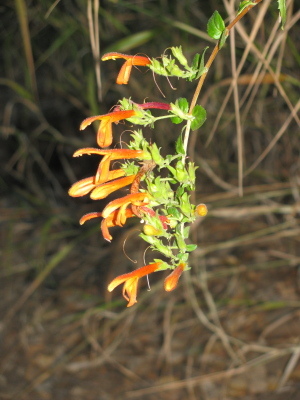 Some flowers that were hanging over the trail. 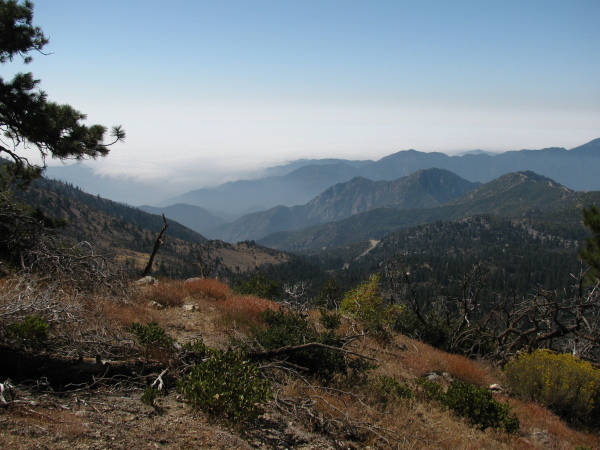 Mount Baden-Powell is not the highest peak in the local range. That is Mount San Antonio (Baldy) SSE of it. 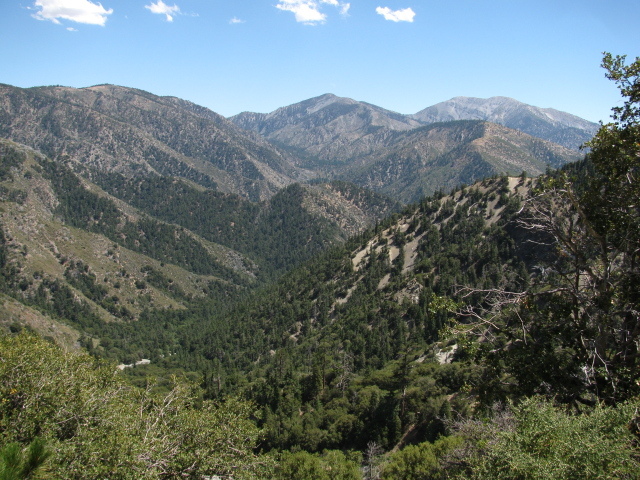 After that, a few of the peaks around Baldy also top out higher than Baden-Powell, but rising over 9000 feet is sufficient to dwarf the nearby peaks and be generally higher than a lot of people ever get to while being able to freely look around and feel the wind in their hair. 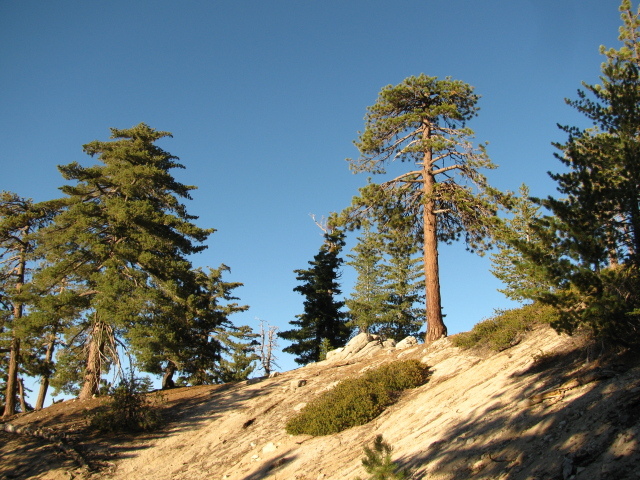 The Pacific Crest Trail passes near it and a spur trail finishes the journey to the very top. I took the quickest route, catching the northbound PCT as it travels southward through Vincent Gap. The trail switch backs for nearly 4 miles up the north side of the mountain before continuing on the generally western traverse of the San Gabriels. 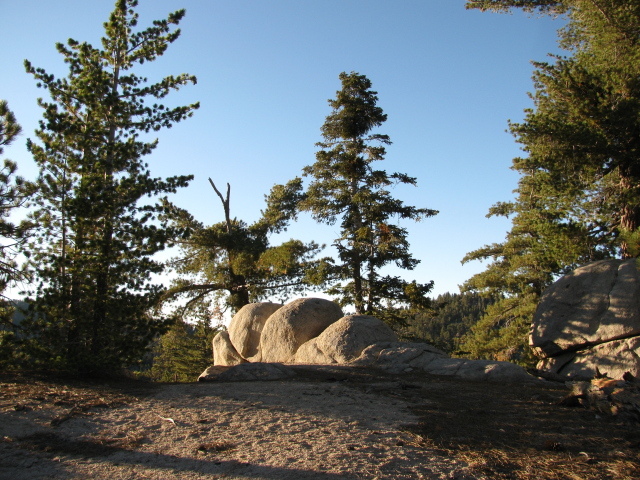 Over the elevation gain, the trees dwindle from a lush forest full of ponderosa and its usual neighbors to a few limber pine populating the nearly bald top. Vincent Gap is obvious if you know what to look for, but it didn't seem to have a sign for eastbound traffic. The road drops down to a wide and low pass through the mountains. A huge lot is on the south and some dirt roads head off to the north. The lot had quite a number of cars in it, but it also has quite a number of choices for hiking, with the gulch, a mine, the mountain, and whatever is north along the roads or the southbound PCT, although those are likely considered routes between interesting things like the Devils Punchbowl below (one road goes there) or the Blue Ridge (where the PCT goes). The trail up the mountain starts next to the biffy on the west end. There's a big sign and a lot of information at the parking lot. After passing that, there's this more traditional trail sign. It says 3.7 miles to the mountain, 9.4 to Windy Gap, 9.7 to Little Jimmy Trail Camp, and 11.8 to Islip Saddle where the trail hits road again. The switchbacks start immediately. After the first mile, there is a bench. It is a nice bench with a nice view, but it felt like a rather short mile to me. After the second mile, there is a spring. I saved the spring for later and continued on. There were a few camping sites after it. After the third mile I realized that, in general, switchbacks aren't still going after the third mile. I was getting a bit tired. Throughout, I was swapping places with a couple who were hiking faster, but resting for long periods while I simply kept going but at a slower pace. I was getting a lot slower as the last mile up wore on and their rests were getting more frequent. At one point I mentioned to them that it was less than half a mile to go (and it was) and it seemed to help them along although I was still feeling quite slow. The trail very quickly offers views of the surrounding country which are better with each turn on the switchbacks. So that's something to look forward to.